Diving overhead environments is a whole different level than any other form of technical diving. You are in enclosed spaces, with no direct access to the surface. 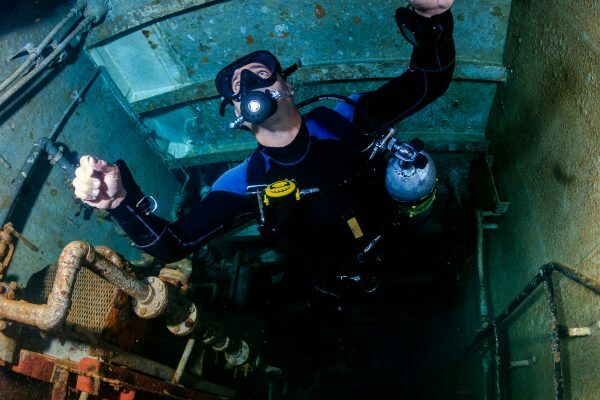 At the TDI Advanced Wreck Diver Course, we teach you the proper techniques, to enter and exit a overhead environment safely. Welcome to the Wreck Diving Course at Chang Diving Center. We teach Advanced Wreck Diving, at the biggest Wreck in the Gulf of Thailand! The HTMS CHANG. Wreck Diving invites you to have a look at a part off the lesser-known underwater world. Colour ceases to exist, where daylight no longer exists, and nature has set aside a biological clock, especially made for the slow ticking world of overhead environments. Technical Divers wishing to venture in historical overhead areas can follow us deeper into the depth, where time has stood still. Dive where few divers are able to and re-live life on board of a ship, venture into the bellows of the hull, engine rooms, passageways and passenger galleys. Diving overhead environments is not everybody’s thing. Chang Diving in Thailand Koh Chang is offers training for Overhead Environments. With these course you are taught how to safely dive these beautiful and dangerous diving locations. salvage of gold or other cargo, but in the recent years, more out of interest to answer open questions into how and why the ship did sink, what was on board? it provides a first-hand insight into context for the loss, such as causal connections, geographical associations, trade patterns and many other areas, providing a microcosm of our maritime heritage and maritime history. Each succeeding level involves greater risk, and will normally require greater levels of training, experience and equipment. Non-penetration wreck diving is the least hazardous form of wreck diving, although divers still need to be aware of the entanglement risks presented by fishing nets and fishing lines which may be snagged to the wreck (wrecks are often popular fishing sites), and the underlying terrain may present greater risk of sharp edges. Penetration within the light zone presents greater hazards due to overhead and greater proximity of the wreck’s structure, but because of the proximity of a visible exit point, and some amount of external light, those hazards are more manageable. However, there is clearly a greater risk of entanglement and silt-out inside of the structure, as well as the requirement to move laterally to a defined exit point before one can surface in the event of an emergency. Full penetration involves the greatest level of risks, including the risk of getting lost within the structure, the risk of complete darkness in the event of multiple light failures, and the inability to escape unassisted in the event of a disruption to air supply. These categorisations broadly coincide with the traditional division between “recreational” wreck diving (taught as a specialty course by recreational diver training agencies and normally limited to the “light zone” and/or 100-130 cumulative feet of depth plus penetration) and “technical” wreck diving (taught as a stand-alone course by technical diver training agencies). All wrecks are in-between 14m to 42 meters and need more decompression training before engaging in dives on them. Inform yourself about the possibilities of combining courses with expeditions to these wrecks and check our schedule for future trips. Every year we receive more and more inquiries from diver who want to go wreck diving, since we can Dive the HTMS Chang Wreck . At Chang Diving Center, we are not only fully equipped with rugged wreck diving equipment, we also offer specialized courses as advanced wreck diving at the Biggest Wreck in Thailand the HTMS Chang , T11 and we offer Special trips for the PAK 1 Wreck.